The Honda Insight hybrid preceded even the Toyota Prius in the U.S. market as the first widely available hybrid passenger car. Back then the car was allegedly achieving a fuel mileage of 70 miles per gallon, and it quickly became a favorite of early adopters interested in the green car scene. Then, the vehicle was pulled from production, reinvented, and attempted to make a comeback, but the new Insight only boasted 40 mpg fuel economy ratings. What happened? That's what we set out to discover during our week-long test of a 2012 Honda Insight hybrid - the next generation of Insight. It’s inconceivable that an automaker could advance 10 years in automotive technology and build a car with half the fuel mileage of its predecessor, unless it were a radically different car. Well, it turns out that the new Insight, reintroduced in 2010, is a radically different design. The first Insights were two-seaters with a long shallow hatchback trunk, no air conditioning, and bodies made out of super-light materials to save weight. Everything that could be done to save fuel was done to these early cars. But Honda wanted to bring back a car that would have more mass appeal to consumers, so the two-seater became a family-friendly 5-seater, the air conditioning was added back in, and the car got more power to please the new buyers that weren’t part of the hypermiler set. Honda offset these weighty additions with modern fuel-saving technologies such as the car’s ECON ASSIST button that throttles the gas and modifies the air conditioning and other systems to automatically maximize fuel efficiency. The Insight also now has a start-stop feature that puts it in EV mode when at a full stop, and the body uses Honda’s latest weight-saving techniques and aerodynamics. Still, with average driving and using the ECON ASSIST button only about 70% of the time, we averaged 40 miles per gallon, exactly what the new Insight is rated for. It’s not bad fuel economy, but we still had hoped for better from a car that feels somewhat underpowered. We were ready to gripe about the fact that we used a half tank of gas with just one week of driving, until we filled up for a paltry $16.50 and discovered the Insight’s gas tank is Chevy Volt-sized, at just 8 gallons. Even driving the Insight carelessly and impatiently for 175 miles, we still only used 4.4 gallons of gas. That’s not bad, really. The hypermilers could do much better. So, after a week of living with the little Insight, we finally fell in love with it, or at least in like. It offers navigation, satellite radio, air conditioning, 5 seats, and a spacious trunk and still manages to be reasonably efficient. Plus, the Insight is not only a radically different design from the original: it is a radically different price, too. The 2011 Honda Insight currently retails for a starting price of $18,200-$23,265, which puts it at half the cost of an equivalent plug-in Prius or Chevy Volt. Now that’s eco and frugal, something we love very much indeed. To Driverz bellow. The 325E on Fuelly across aprox 15 vehicles in real life figures got 22mpg US, Super beetle is quoted on Fuelly at 23 MPG, these figures are real data from real drivers, so considering the Insight probably weighs 50% more than a VW beetle with Aircon , Air bags, comfort, quiet etc etc, I think 40 to 60 mpg is a BIG step forward. I still dont understand all I want to know is when to use the econ button, what does it mean when econ sign shows up and when it does not show up. Kentercat, you stated' "We are being conned big time by Auto manufacturers about their new, high priced, fuel efficient automobiles." At one time, I believed your point to be true. However, today I am placing more blame on our government. For years, the standards for emissions have changed. All cars must burn cleaner and reduce emission levels. This clean burn comes at a cost. Every time the government changes the standards, the cars lose mpg. In many cases, any gains made by technology have been cancelled out by the restrictions of Washington. I do not design cars, but this is how I see it. To me, the auto industry has worked very hard to stay ahead of the real terrorist, Washington DC. @Fatherfigure and driverz - Those 20 year old cars also didn't have ABS, TPMS, traction control, 6 airbags or crumple zones. Neither was it's exhaust as tightly regulated as car's are today. Not that I'm complaining - I'll take the safely features any day, since either way I have to share the road with tractor-trailers and plow trucks, not to mention all the SUV's and light trucks. Basically, apples and oranges. @Kentercat The CR-Z actually has a more powerful internal combustion engine as the insight, its just the hybrid portion that they share. That's why the CR-Z gets worse mileage. Also, the manual version is a 6 speed, not a 5 speed :-) My average for the past 7000 miles in my CR-Z has been 43.2mpg, and I almost never put it in eco mode, just normal or sport. I strongly agree with Fatherfigure's comment! We are being conned big time by Auto manufacturers about their new, high priced, fuel efficient automobiles. I drove a 1986 BME 325E with a six cylinder engine for 10 years and averaged 31mpg highway mileage without the gadgets and hype. My 1973 Super Beetle cost $2400.00 and produced 35mpg highway for eleven years. The 1953 Nash Rambler Metropolitan produced 35mpg for a lot less money. I realize there are air pollution standards to meet, but how can these Auto manufacturers act like they are doing us a favor at $25,000.00 - $60,000 per vehicle. My 1993 Honda Civic 4 door sat 5 and got 46mpg with over 200,000 miles on the odometer. It had air and all the other amenities so please don't act like 40 mpg is anything to report unless you are mentioning it in disgust. My 2011 Insight averages 45 MPG. The Econ button generally stays on unless A) I'm pulling away from work, it's 100 degrees outside, and the air conditioner/engine keep shutting down at every stoplight, or B) I'm really pressed to merge into traffic. If you miss the old Insight, check out the CR-Z. It's basically the same power-train as the new Insight but shoved into a two-seater. Despite the smaller size/same power train, it's less efficient, because it's designed as a sport hybrid. I would ask an actual owner, though, how it runs in econ mode. It also comes in a five speed, wereas the Insight is CVT. There is a multi-function display that can either give you real-time mileage or optimal braking/acceleration feedback, making hypermiling a fairly minimal effort activity. It also scores the last five drives as a bar graph. The Insight is as good a tool for saving gas as the Wii Fit is for dieting and exercise. Insight is 80-85 percent of a Prius (mileage-wise) with more masculine styling and $8000 cheaper. If you intend to keep the car more than 5 years, or gas prices hit $5 in the next three years, the Prius may pay for itself. I own a 2011 Honda Insight and routinely achieve 55 - 60 mpg in highway driving. Mileage for city driving is around 42 mpg. It is an excellent car. 40 MPG does seem a little...meh. But for a sedan is supposed to be able to seat 5, that is better than 10 years ago. My 2000 Insight (#221) had air conditioning. My 2001 Insight used to get, and my 2006 Insight gets, 70 mpg regularly--on long trips I can easily exceed 80 mpg. Honda should offer a more expensive model of the new Insight with the fancier, more fuel-efficient engine from the Civic Hybrid for those who prefer to pay up front to save on fuel costs later (and to top the Prius). The first thing we noticed about our test car was the Prius-like shape. Many journalists have criticized this as an aerodynamic knockoff, but the truth is that the Insight was the originator of the hybrid wedge shape, 7 months before the first Prius hit the U.S. market. From the outside, the new Insight looks like a Honda from the front and a hybrid from the rear, but loses all its original radical styling, including the dead-giveaway covered wheel wells. The vehicle remains close to the ground, however, with a low-riding seating position and low ground clearance for maximum fuel efficiency. Unlike the Chevy Volt, which uses slippery low-rolling resistance tires to help fuel economy along, the Insight uses tires that can, say, handle driving off into a field of sunflowers for a photo shoot. 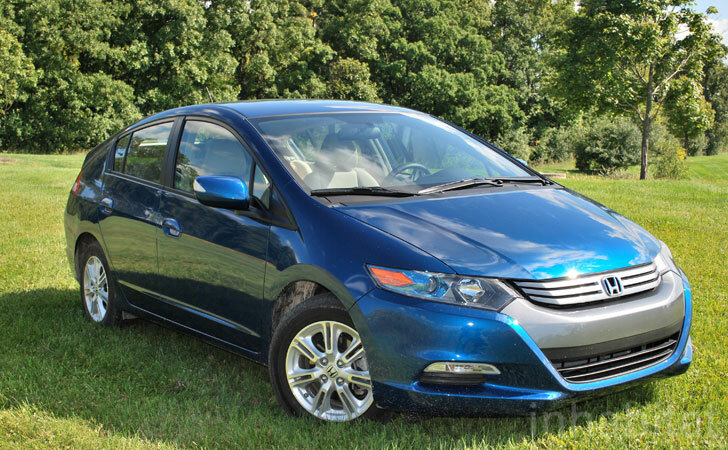 Braking, handling, and traction were also an improvement over the Volt and the plug-in Prius. The Honda Insight is now the most normal car of the bunch in terms of everyday driving ability. Adding second-row seats has changed the shape of the Insight, but the rear hatch door remains steeply raked--almost horizontal. No exterior badging or stickers to show off the green credentials of this car. It is designed to blend into its owner's modest lifestyle seamlessly. The rear window is so steeply raked, in fact, that the driver sees a lot of reflections of the road or sky in the window while driving. Slightly distracting but not a big deal. The Insight's trunk is very similar to its Prius and Volt cousins. Long, shallow, and convenient for basic everyday storage. The doors have less insulation in them than the average car, presumably to save weight. This gives the car a slightly hollow tin can sound when you close the doors. A thoroughly modern cockpit, with every convenience that was missing in the original Insight. The ECON ASSIST button allows the driver to automatically pull maximum fuel efficiency out of the car by pushing a button to throttle the gas and air conditioning. Meanwhile, the speedometer at the top of the dash gives real-time feedback about the efficiency of your driving, glowing green for economic driving, fading to green-blue for moderately fuel-efficient moves, and turning royal blue for aggressive starts and stops. The one thing we couldn't figure out was why the vehicle loved to go into EV mode so often at a stop when we were first driving the car, but by the end of the week kept the engine on as pictured here (it would have faded to green if the engine turned off at a stop). Was the Insight learning that we were a tad aggressive? The Insight's instrument cluster is a combination of traditional tachometer, odometer, and fuel gauge, and an advanced power monitor that tells the driver when they are operating in power-assist mode or recharging the battery. Same blue-green scheme for the power monitor keeps things simple. The green light at the top of this photo indicates that ECON ASSIST mode is engaged. Automakers actually have custom colors they use across vehicle lines for everything from badging to electronic displays. We're happy to see the traditional Honda blues and reds on the instrument cluster here. The fuel meter seems to indicate that you're driving like a fool, until you realize that half a tank of gas is only 4 gallons. 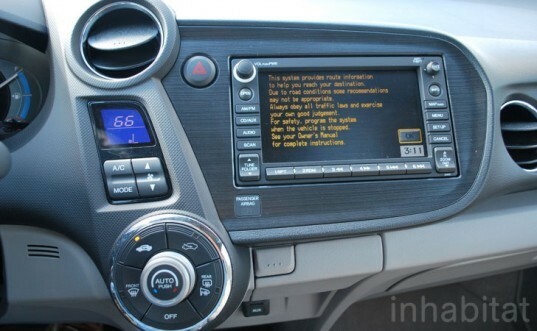 The HVAC system is split into a small digital display and an LED-lit knob, while all the audio and navigation controls are operated via the nav screen. It's a very well-organized way of dividing things up, at least compared with most other current vehicles. Nice digital HVAC display. It takes a little getting used to that the up-down buttons here are for fan speed and the knob below controls temperature, but we love the unique design nonetheless. The blue LED-lit center knob controls temp, while surrounding buttons select HVAC mode. Of course the new Insight has a traditional power outlet and an AUX input. USB plug for iPods is located in the center armrest. This is a pretty standard setup for an automatic transmission gear lever. We were hoping for something a little more futuristic. Maybe next year.